Miroslav Svitek, Ph.D., visiting professor from Czech Technical University in Prague entertained the crowd of 100 with his accordion. This year was no different, as General Motors put two of its latest vehicle designs on display on campus and provided T-shirts for engineering students. Lockheed Martin brought their popular jet simulators and also held interviews for graduating seniors. The week was capped with the inaugural E-week College of Engineering Awards Banquet. Theresa A. Maldonado, Ph.D, dean of the College of Engineering said she hopes the banquet grows into a new tradition that recognizes the work of the faculty, staff and students from the engineering department. "I am launching this event, to recognize individuals that do outstanding work with in our college," Maldonado said. 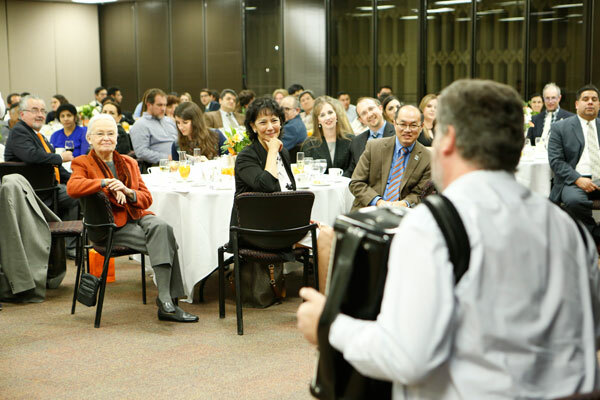 During the celebration, Miroslav Svitek, Ph.D., visiting professor from Czech Technical University in Prague entertained the crowd of 100 with his accordion. UTEP President Diana Natalicio was among those in attendance. The banquet concluded with a presentation of awards that recognized outstanding students, faculty and staff. The Dean's Award for Excellence in Research went to Yirong Lin, Ph.D., associate professor from the department of mechanical engineering. Lin has published 88 articles since joining UTEP in 2011, and has been awarded grants from the National Science Foundation, the Department of Education and the Department of Defense. Lin's research interests are in the field of design, fabrication and harvesting and storing solar energy. Lin was awarded $1,000 and a plaque for his work. The Dean's award for Excellence in Teaching went to Deidra Hodges, Ph.D., assistant professor from the department of electrical and computer engineering. Since joining UTEP in 2014 Hodges has developed three courses within her department and demonstrates high quality teaching that is reflected in her student evaluations, said Maldonado. Hodges was also awarded $1,000 and a plaque for her work. The Dean's Award for staff excellence was awarded to Concha Ruiz. Ruiz was recognized for her efficiency, responsibility and her sensitivity and responsiveness to the college and her dedication as an administrative assistant in the department of civil engineering. Ruiz received $500 and a plaque for her work. Truman Word J. was named this year's St. Pat for Texas College of Mines Day, UTEP's longest-running campus tradition, which takes place in March. The Eloise and Patrick Wieland Graduate Fellows Program serves to provide competitive fellowships to graduate students to further their research within their field of engineering or science for the benefit of human health and wellness. Recipients of this endowment are officially known as Wieland Fellows and have form a close-knit academic and collegial network with research mentoring that is being provided by their senior faculty members within their college.